A Chabad rabbi kidnapped by a gang in Ecuador and then released has arrived in Israel with his wife and children. “We said Psalms for his safe return”, said his family. Rabbi Tomer Rotem’s wife Rivka said her husband was brutally beaten by the gang, which she described as ”people who get money and then bury the people” who gave it to them. 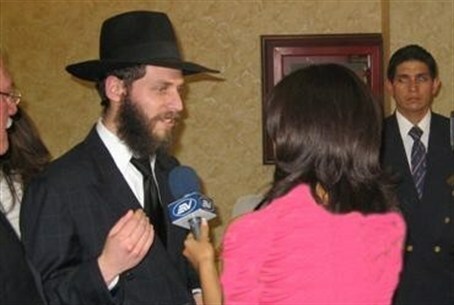 The Chabad emissary and his family have resided in Ecuador for six years. Rabbi Rotem recently received a phone call from someone who said he wanted to contribute money,” according to his wife, who revealed the details of the kidnap operation. When Rabbi Rotem reached the address to meet the man, he was kidnapped. The head of the non-Jewish gang is an Israeli whom the rabbi recognized. The gang demanded half a million dollars for his release, and Rivka said she received telephone threats not to talk to the police. “We did know what to do,” she related, but her seven-year-old child began saying Psalms for the safe return of his father. Police were notified of the kidnapping and Ecuador security forces tracked down the gang’s hideout. Rabbi Rotem was freed unharmed except for mistreatment. Rabbi Rotem said his kidnappers were masked, aimed machine guns at him and threatened to make him eat pork.